You know how I’ve been sorting through old stuff lately? 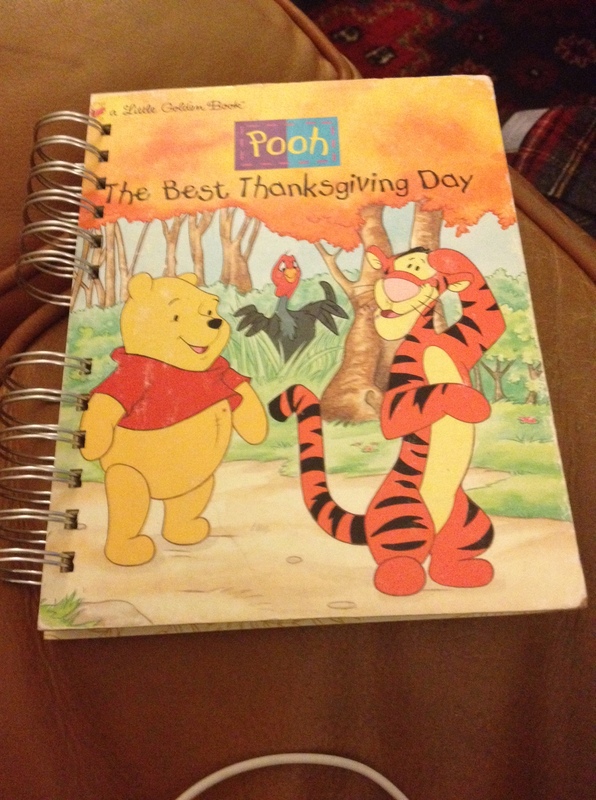 Well, I recently found this journal my mom bought me several years ago. Thinking I’d get to re-visit angst-ridden teenage poetry, I flipped open the first page. Instead of a journal entry, guess what I found? A biography about Heather Smeding, our house’s former owner. My mind was boggled. I suddenly had this feeling that the cosmos has big plans for me, that everyone is connected and that someday, I’d find my favourite socks. Then I remembered : Simcoe County only has 446,000 people living in it. The chances of someone from Perkinsfield meeting someone from Elmvale (15 minutes away) are pretty good. Damn. I guess those socks really are lost. Even though the whole thing wasn’t destiny, it was a nice reminder that like-minded people find ways to connect. When I met Heather, I liked her instantly. She had amazing art, talked straight, and had a subtle (but sharp) sense of humour. She was part of the reason this house appealed to me. 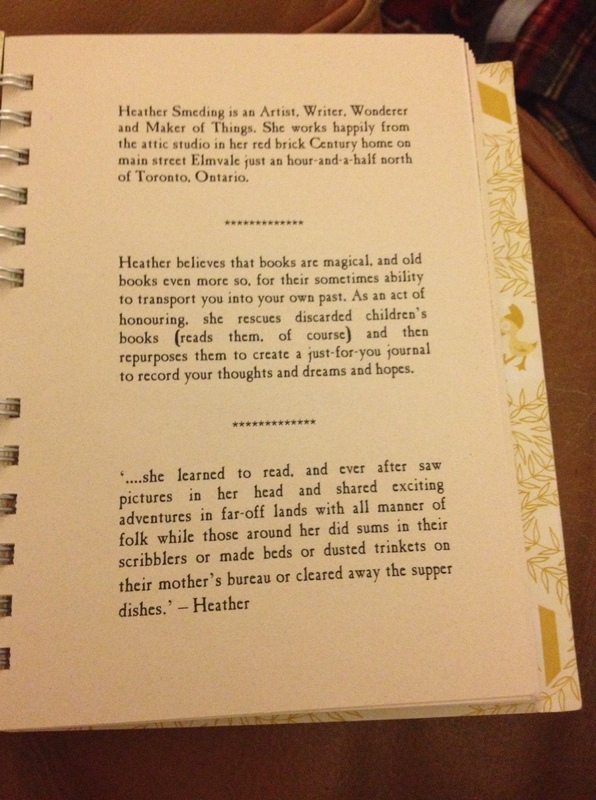 My favourite part of the journal is the last page, where Heather tucked a little list of journal entry prompts. 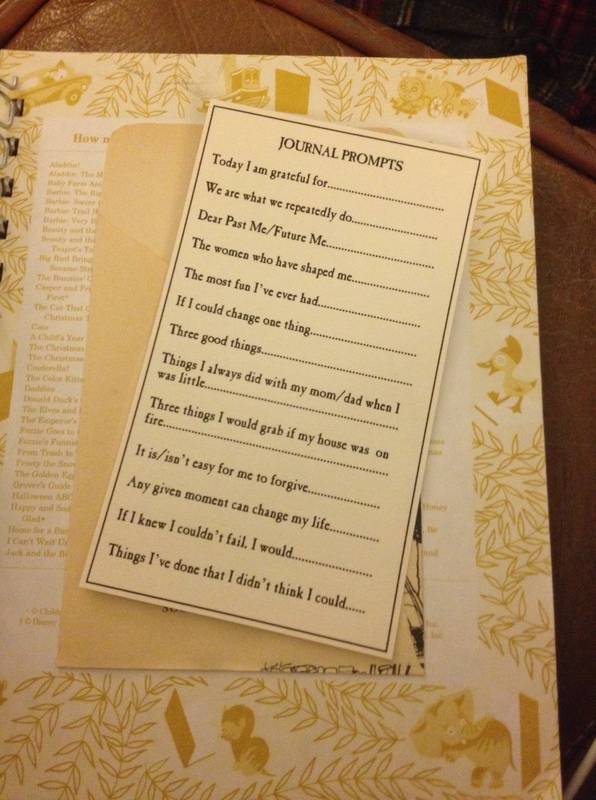 I think I might use this journal to keep track of the many things I’m grateful for, starting with my mom, good food, friendly people, and happy coincidences. This entry was posted in Lifestyle, Personal growth, Small Town Living and tagged artist, clean, destiny, Elmvale, fate, grateful, Perkinsfield, pooh bear, purge, Simcoe County, sort, thanksgiving, Treasure, winnie the pooh by Mikaela Lefaive. Bookmark the permalink. I bought this journal on a spring open studio tour in Ila Kellermann’s studio. Her friend, Heather, was selling her artwork. She takes old books or old book covers and transforms them into journals. 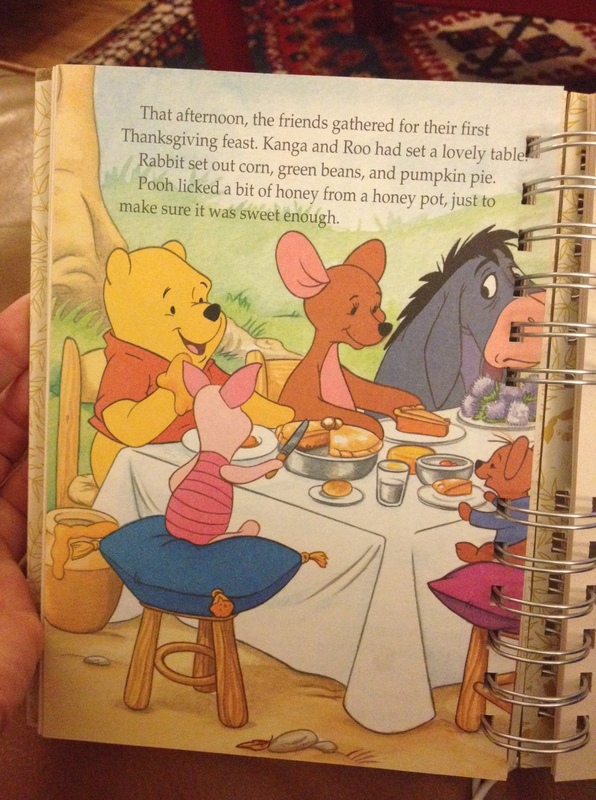 Of course I chose Winnie the Pooh for you. It is a small world! Huh……the things you find when you google yourself trying to find an old website!! I hope you love the attic as much as I did.